UPDATED: Sun., April 15, 2018, 9:31 p.m.
“The Brahms” they referred to was that composer’s Violin Concerto in D Op. 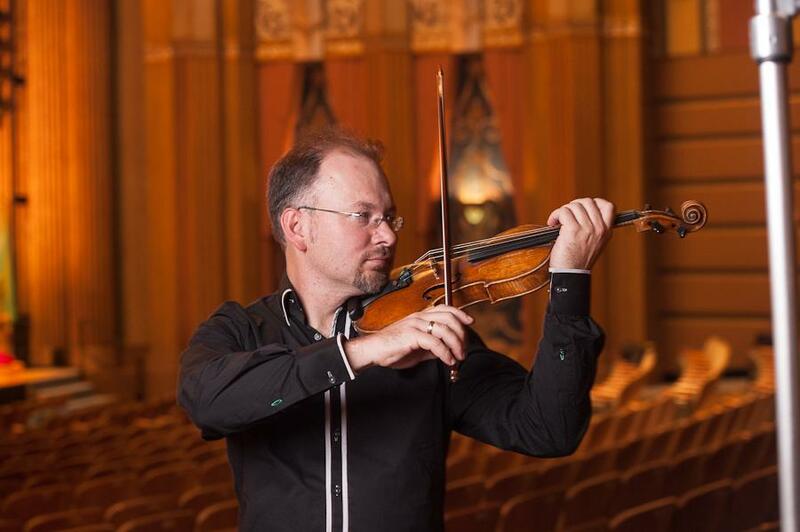 77, and the reason for the keen anticipation was not so much the stature of the piece as the fact that it was to be performed by Mateusz Wolski, concertmaster of the Spokane Symphony. In the 11 years since he joined the orchestra, Wolski has won the hearts of his audience not only through impeccable musicianship, but through his ability to express deep and authentic emotion. As it happens, this was also Johannes Brahms’ goal in writing his violin concerto in 1878. He despised the flashy pieces thrown together by itinerant violin and piano virtuosos of his day, but rather modeled his concertos on those of Beethoven, who portrayed the soloist as artist/hero, confronting the challenges and disappointments of life, and ultimately transcending them through the power of art. Thus, as we progress through Brahms’ concerto, we are buffeted by violent changes in mood, as melodies suggesting calm contentment are interrupted by passages of fierce conflict. The emotionally charged nature of the music is reflected in the fearsome difficulties Brahms throws before his soloist. Some players attempt to render the solo part as elegantly as possible, projecting a sense of Olympian detachment, but Wolski embraced Brahms’ challenge as an opportunity to convey the most intense feeling possible by plunging into the music’s passions, rather than floating above them. At the point of Wolski’s entry, following a long, turbulent orchestral introduction, his heart got a bit ahead of his fingers, resulting in a handful of smudged notes, which were the last, however, we heard all evening. Whether in passages of grim ferocity or angelic purity, Wolski showed himself the master, not only wide leaps and double-stopping, but of the full range of emotions, tragic and triumphant, that Brahms wove into this greatest of his concertos. The role of the orchestra in this concerto is not one of discrete accompanist, but of a full participant, which requires that the conductor be a match for the musical skill and insight of the soloist. In Music Director Eckart Preu, Wolski’s blend of technical mastery and intellectual grasp was matched perfectly, as we might have expected, given the superb performances of Brahms’ symphonic and choral music Preu has given us over the past 14 years. As always, his interpretation was characterized by transparency of sound, clarity and directness of phrasing, and an ability to maintain a constant sense of forward motion without rushing; the greatest challenge in interpreting the music of Brahms. Among the many brilliant contributions from the orchestra to the success of this performance, one must single out the playing of principal oboist Keith Thomas. The second movement of the concerto opens with an exquisite melody suggestive of great spiritual tranquility which Brahms, with characteristic diffidence, assigns not to the solo violin, but to the oboe. Thomas’ rendering of this passage was a two-minute masterclass in musicianship; so alert and imaginative was his phrasing, while his breath control made one suspect the existence of a third lung. The propulsive energy and transparent sonority that characterized Eckart Preu’s approach to the Brahms Concerto were no less in evidence in the Symphony No. 4 in D minor Op. 120 by Robert Schumann (1851), which comprised the second portion of the program. While a seminal figure in the history of music in the 19th century, Robert Schumann’s manifold gifts did not include the skill in developing musical ideas over long spans of time so central to the music of Beethoven and Brahms. His genius lay, rather, in the creation of ideas of great character and poignancy. The Fourth Symphony, composed as a birthday gift to his beloved wife, Clara – a gifted musician and composer herself – resembles a brilliant bouquet of individual blossoms, rather than the intricately planned landscape we saw in the Brahms Concerto. The challenge in performing such a piece is to avoid monotony when, though repetition, Schumann’s delightful ideas threaten to outlast their welcome. Preu and the orchestra, however, brought out all the color and fragrance of Schumann’s ideas, while maintaining interest through tightly sprung rhythms and the highlighting of instrumental details that are often overlooked. Published: April 15, 2018, 2:32 p.m. Updated: April 15, 2018, 9:31 p.m.